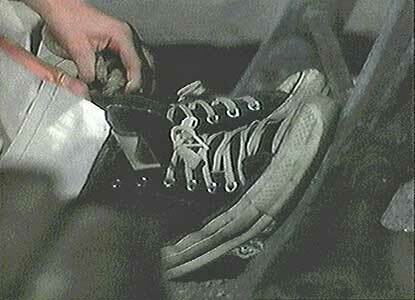 Kelly Reno wears black high top Converse “Chuck Taylor” All Stars in the film. 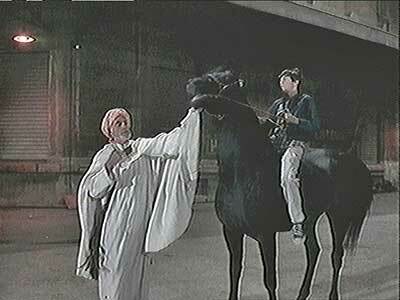 The Berber chief takes the black stallion away from Alec. This sequel to The Black Stallion is set in the year 1947. Alec Ramsay (Kelly Reno) is living on a horse ranch in New York with his champion horse Black. Word of the amazing appearance, speed, and victories of Black with Alec as his jockey has received a lot of attention, and even gotten back to a couple of rival Arab tribes from Morocco. As the film opens, these two rival tribes, the Berber and the Uruk, are both plotting to take the horse away from Alec. They have journeyed to America to take the horse and bring it back through Casablanca to their tribal homeland south of the Sahara Desert for a special race that is used to determine wealth and power between the tribes. (In the original film, The Black Stallion, both Alec and Black were shipwrecked and ended up abandoned on an island. The two bonded while on the island, and when they were eventually rescued from the island, Alec insisted on bringing the horse back, even at the risk of losing his opportunity to be rescued.) The two rival tribes both try to steal the black stallion from the ranch at night. The Uruk attack first, setting the barn on fire to create a diversion. During the confusion, the horse is taken by the Berbers. Alec soon discovers the loss and runs after them. He is able to grab onto the trailer and ride with Black. When the trailer arrives at its destination, at a warehouse in the port of New York. Alec gets on Black and attempts to gallop away. But the Berber are able to contain them, by locking all of the gates. Alec is taken off of the horse by the chief’s men and the chief (Ferdinand Mayne) tells him that Black’s real name is Shitan, and that they are his true owners (from prior to the shipwreck). Alec protests, but to no avail, and the Berbers overpower Alec and leave him bound and gagged in the warehouse. Although Alec is able to quickly escape using his pocket knife, it is too late. 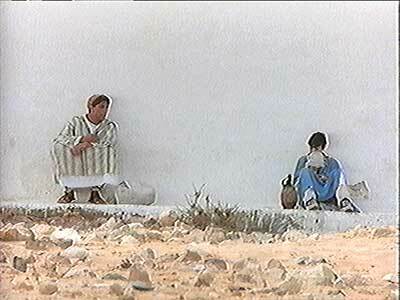 The Berbers have already loaded Black onto a ship and sailed off to Casablanca. Alec is able to escape from the ropes binding his hands and feet with his pocketknife. Dejected, Alec at first walks aimlessly around the port area, but then he finds out about a seaplane flight that regularly flies to Casablanca. He tells his mom (Teri Garr) not to worry, and without any second thoughts or planning, Alec decides to pursue the Berbers and reclaim his horse. Alec is able to stow away on the air bus because he is thought to be a member of a school group that happens to be touring the plane. The plane takes off, but eventually Alec is discovered, when he sneaks into the steward’s cabin to get something to eat. Upon arrival in Casablanca, the airline authorities tell Alec that they will be returning him home to his mother and turn him over to the French Foreign Legion for detention until then. But Alec is left free to roam around the legion compound, and determined to continue his quest, he is able to enlist the help of some young Moroccan kids he meets. They get him some Arab dress so he can pass by the soldiers unnoticed, and help him escape from the fort. At the edge to town, Alec runs into two of the Urok conspirators who have been pursuing the horse (Allen Goorwitz and Woody Strode). They recognize Alec and pump him for information. When he shows them a Urok medallion he recovered from the fire back in America, they agree to take Alec along with them for a while, but leave him stranded half way after taking the medallion. A truck filled with refugees comes along, and Alec is able to hitch a ride. Here he meets up with Raj (Vincent Spano), a young Arab educated in America. Although reluctant to help Alec at first, Raj eventually agrees to take Alec across the desert to Wadi Draa, his homeland and that of the Berbers and Urok. They undertake the arduous journey across the Sahara Desert. There are many adventures and setbacks along the way, but nothing can stop Alec’s determination to be reunited with the Black Stallion. Raj learns something from the courage displayed by Alec, and Alec learns about the tribal customs and traditions of the Arab tribes where his horse came from. Alec stows away on a clipper ship (sea plane) to Casablanca to get Black back. Finally, Alec is reunited with Black, but the Berbers have possession of him, and they are determined to have the chief’s daughter Tabori (Judy Thelan) ride Black in the all important race between the rival tribes. But Black only responds to Alec, so eventually the Berbers realize that they must enlist his assistance. The remainder of the film deals with how Alec handles the preparations for the race, deals with the continual Urok attempts to steal Black or stop him from racing, and what the Black Stallion’s ultimate fate will be. After many adventures in the desert, Alec finally finds Black again. The Black Stallion Returns doesn’t have the plot twists and character diversity of the original film, but it still has an interesting story to tell of the extraordinary relationship between Alec and his horse. This is great family fare, and an enjoyable adventure about the courage and determination of an adolescent. There is much about it that you can predict, yet you are drawn into the story because of its simplicity and heart. Kelly Reno puts in another great performance as Alec, and how can you not appreciate the great horse scenes (and the work of their trainer) throughout the film. Vincent Spano is likable in his role as Raj, and although the roles played by some of the other character actors have element of stereotype in them, you still enjoy their work in the film, Francis Ford Coppola is a master of this kind of panoramic adventure story, The film is beautifully shot from start to finish, a pleasure to watch, and a fine example of the Hollywood big screen family adventure story. Alec casts his lot with Raj to get through the desert. 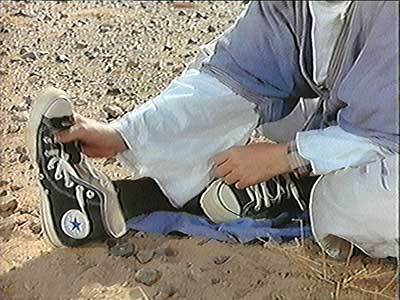 Alec empties the desert sand out of his chucks. Francis Ford Coppola films are noted for their beautiful wide angle cinemaphotography and effective lighting. The Black Stallion Returns is no exception, with especially well-done desert scenes. 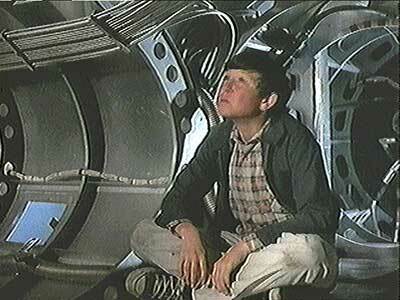 The camera work is especially chucks-friendly, and they appear in nearly all of the scenes of the film. They are the one American image that continuously appears throughout the film, and they remind you that Alec is an American kid struggling to survive in a harsh environment and very different culture. In the various films reviewed on this site, we have seen black high top chucks worn in the Amazon jungle, walk the streets of New York’s Hell’s Kitchen, traipse through medieval England, raft down the Mississippi River, time travel on the face of a postage stamp, and now trek through the Sahara Desert. Pretty cool shoes! Alec and his camel rest, exhausted by the desert heat. Although there are interesting chucks shots throughout the film — Alec on horseback, stowing away on a seaplane, and escaping from captivity — the best scene sequence is when Alec and Raj are crossing the Sahara Desert alone and nearly do not make it. 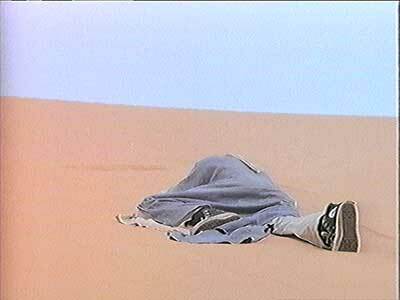 A dehydrated Alec collapses on the desert floor. The Black Stallion Returns. (1983) Kelly Reno, Vincent Spano, Allen Goorwitz, Woody Strode, Ferdy Maguire, Jodi Thelan, Teri Garr. Directed by Robert Dalva. Categories: Drama, Action/Adventure, Family.